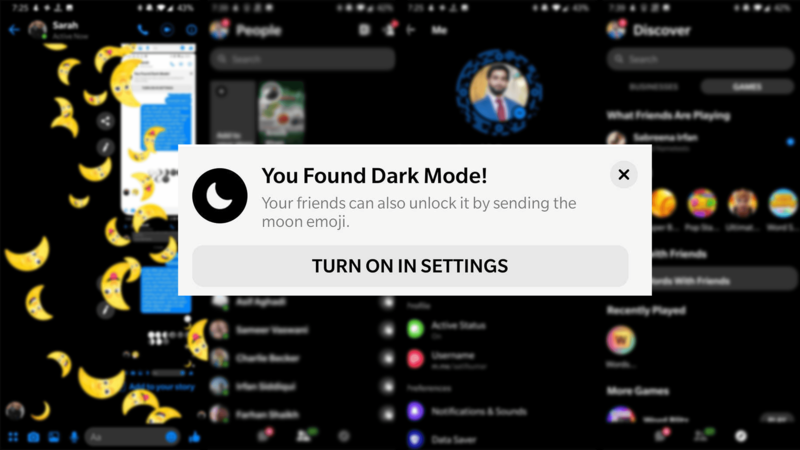 Discovering the dark mode easter egg is as simple as sending the crescent moon emoji  in a chat and tapping through the ensuing popup menu. Some users had to double-tap the moon emoji, while others had to restart the Messenger app and enable the feature from settings. The app warns that darks mode is still a work in progress and isn't universal yet — though other than sub-sections of the settings menu, it seems to work everywhere else. Facebook is determined to keep users in its ecosystem, and with a redesigned Messenger UI, the ability to un-send messages, and a possible infrastructure integration of Messenger, Whatsapp, and Instagram, the company seems to hope convenience and ease-of-use trump any privacy concerns users may have. Facebook acknowledged dark mode for Messenger in a blog post, calling it "a hidden, limited-time only experience." It also revealed that the feature will roll out to all Messenger users via the settings menu in the coming weeks. Facebook has now rolled out dark mode in Messenger globally, accessible through a toggle switch in the settings menu. The Android Police Facebook inbox will finally be free of crescent moon emojis.